This website is the official website of Wheatley Rugby Football Club ("the Club", "we" and "us"). If you have any comments or questions about this website or any of our services please contact us by one of the methods shown below. read them carefully before placing an order. Our commercial partners and other third parties may occasionally promote their goods or services on the Website or through our email services. Whilst we try to encourage our partners to offer good quality products and services at competitive prices we have no control over them or other third parties and, we do not endorse the products or services they offer or give you any assurance that they will be suitable for your needs. It is your responsibility to satisfy yourself in this regard and we have no liability in connection with the sale of any goods. you warrant that you have obtained all necessary licences and/or approvals in order to allow the Club such use..
Wheatley RUFC (WRUFC) is committed to protecting your privacy and ensuring a secure online experience. In general, you can view this site and all the latest news and results without telling us who you are or revealing any information about yourself. Sometimes, however, the WRUFC needs to monitor website usage to help it to develop the website and our services. WRUFC offers certain functions and services which, if you choose to use them, will require information from you in order to work, such as your name, email, address and mobile telephone number. 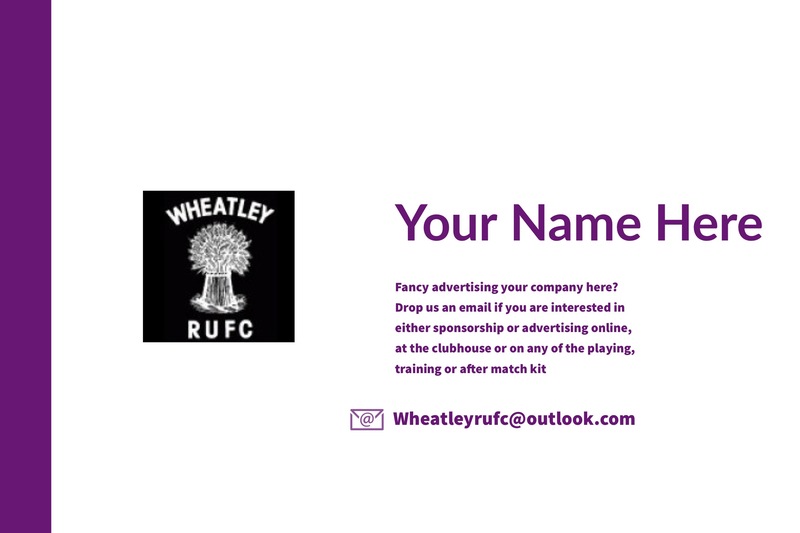 WRUFC will endeavour to let you know before your personal information is collected from you on the internet. To alert you to new services, special offers, and other info, unless you have indicated otherwise WRUFC is very much aware that some people will not want their information used other than for the purposes for which it was supplied; some will want to receive information from WRUFC on rugby issues only and others will want to receive more information. WRUFC will use your personal data for the administration of the game, but will give you the choice as to what information if any you wish to receive by email. Products and services available from WRUFC official sponsors - these sponsors will be listed on the WRUFC website. WRUFC has decided that for the first two categories you should be able to ‘Opt Out’ of receiving the information, but that for the third category you will only receive it if you ‘Opt In’. WRUFC will not use (or pass to any third party) contact data on children under the age of 14 for any commercial mailing purposes. If you choose to give us personal information to process an order or provide you with a subscription to a free service then this will be held and processed by the WRUFC in accordance with the GDPR Act 2016. The RFU may also need to transfer your personal information to its agents or sub-contractors who will process it on the RFU's behalf. WRUFC may use your personal information to supply you with information about the WRUFC and/or its related organisations, and new (unless you have indicated otherwise) services offered to the game, as well as their respective activities and ranges of goods, services and opportunities (and otherwise where you have given your consent). WRUFC website contains links to other websites. WRUFC is not responsible for the privacy practices or the content of external websites. Information may be sent to your computer in the form of an Internet "cookie" to allow the PITCHERO servers to monitor your requirements. The cookie is stored on your computer. The PITCHERO server may request that your computer return a cookie to it. Such measures are necessary to allow the PITCHERO to measure the usability of the systems, which will help to continually improve user experience of our websites.  Some data is shared with the RFU, who use your data to regulate, develop and manage the game.  Data is also shared with Email Newsletter system. marketing, you can withdraw this consent at any time.  Amongst the data we collect from you may be medical (including injury) information. We will hold this where you (or your parent) have given consent, so that we can ensure we are aware of your condition and can that you are supported appropriately.  Where you work in a particular role within the game, you may be required to undergo a Disclosure & Barring Service check using the RFU’s eDBS system. The result of this check will be input into your Game Management Service (GMS) record. This policy describes how Wheatley Rugby Club (also referred to as “the Club”, “we” or “us”) will make use of the data we handle in relation to our members and players, including our use of the Game Management System (“GMS”) provided by the Rugby Football Union (“RFU”). The policy also describes the RFU’s use of data on GMS.  your type of membership and involvement in particular teams at the Club, or any key role you may have been allocated, such as Chair, Safeguarding Lead, Membership Secretary etc. Personal data will also be shared with third party service providers, who will process it on our behalf for the purposes identified above. Such third parties include the RFU as the provider of GMS and providers of our email marketing system. We hope that we can satisfy queries you may have about the way we process your data. If you have any concerns about how we process your data, you can get in touch at or by writing to Chair of Communications, Wheatley Rugby Club, Holton , Oxford , Oxfordshire. Where we process personal data for marketing purposes or with your consent, we process the data ongoing unless you ask us to stop, when we will only process the data for a short period after this (to allow us to implement your requests). We also keep a record of the fact that you have asked us not to send you direct marketing or to process your data indefinitely so that we can respect your request in future.